Researchers repurpose a bacterial immune system to be a molecular recording device. Utilizing the bacterial CRISPR/Cas adaptive immune system, researchers at Harvard have developed a method for permanently recording molecular events in living cells, according to a report published inScience today (June 9). The system integrates specific synthetic DNA elements into the bacterial genomes in temporally-ordered arrays, which, once sequenced, can provide a readout of the bacteria’s timeline of DNA events. “The importance of the work is in providing a proof of principle: that a fascinating bacterial immune system may be utilized as a tool harboring an impressive recording capacity,” said microbiologist Udi Qimron of Tel Aviv University who was not involved in the work. The CRISPR/Cas system works by snipping short DNA elements from the genomes of infecting viruses, integrating those elements into the bacterium’s genome (at the CRISPR locus), and using the RNAs produced from the integrated elements to direct destruction of the corresponding virus. In essence, the bacterium keeps a DNA account of its viral foes, and uses it against them. Integration of these viral DNA elements—or oligomers—into the CRISPR locus is nonrandom: the most recent viral elements are consistently integrated ahead of older viral elements in the array. Harvard’sGeorge Church and colleagues considered that this temporal ordering of integration could form the basis of a molecular recording device. If defined synthetic DNA oligomers could be integrated into CRISPR loci just as viral elements are, then sequencing the cells’ CRISPR loci would provide a log of which oligomers the cells had been exposed to and when, the researchers reasoned. To test this idea, the team used an E. coli strain that contained a CRISPR DNA locus and a stripped-down version of the Cas protein machinery. The minimal machinery consisted of inducible versions of Cas1 and Cas2—enzymes required for integrating the DNA oligomers—but lacked all the Cas machinery required for virus destruction. The researchers found that, by introducing specific synthetic DNA sequences into these cells in a timed manner (different oligomers on different days, for example), the resulting sequences of the CRISPR loci did indeed accurately reflect the order in which the oligomers had been introduced. “It’s the first demonstration of the ordered acquisition of intentionally introduced DNA sequences,” said bioengineer Adam Arkin of the University of California, Berkeley, who did not participate in the work. Using directed evolution, the team went on to create new versions of Cas1 and Cas2 that could integrate oligomers in a subtly different and discernable way (though still temporally ordered) to that of wildtype Cas1 and 2. Putting these modified Cas enzymes under the control of a different inducer allowed the team to record DNA events in two different modes—depending on which versions of Cas1 and 2 were operational. “Essentially, we’re measuring concentrations of nucleic acids,” said Church. “Ideally it would be messenger RNAs but in this case it is DNA. . . . This is a proof of concept on the way to other things,” he added.Church suggested, for example, that if a CRISPR/Cas system were to be combined with a reverse transcriptase—an enzyme that converts RNA to DNA—in cells or animals, it could be used to provide a record of which messenger RNAs are expressed, when. Another possibility, suggested Arkin, is to use CRISPR/Cas-engineered bacteria to provide information about the other microorganisms present in an environment—be that the soil, the human gut, or wherever. “[The bacteria] could kill a few neighboring [bugs], secrete an enzyme that cleaved their DNA, and express a competence system to take that DNA in,” Arkin said. “That sounds insane, but there are bacteria who do that naturally,” he added. The foreign microbial DNA could then be incorporated and logged at the bacteria’s CRISPR locus, he explained. S.L. Shipman et al., “Molecular recordings by directed CRISPR spacer acquisition,” Science,doi:10.1126/science.aaf1175, 2016. The ability to write a stable record of identified molecular events into a specific genomic locus would enable the examination of long cellular histories and have many applications, ranging from developmental biology to synthetic devices. We show that the type I-E CRISPR-Cas system of E. coli can mediate acquisition of defined pieces of synthetic DNA. We harnessed this feature to generate records of specific DNA sequences into a population of bacterial genomes. We then applied directed evolution to alter the recognition of a protospacer adjacent motif by the Cas1-Cas2 complex, which enabled recording in two modes simultaneously. We used this system to reveal aspects of spacer acquisition, fundamental to the CRISPR-Cas adaptation process. These results lay the foundations of a multimodal intracellular recording device. By stripping down the genome of a mycoplasma bacterium to the minimal genes required for life,Craig Venter and colleagues have created a new organism with the smallest genome of any known cellular life form. The work, published in Sciencetoday (March 24), is the closest scientists have come to creating a cell in which every gene and protein is fully understood—but they are not quite there yet. The quest to synthesize a minimal genome with only the essential genes for life is one researchers at the J. Craig Venter Institute (JCVI) in San Diego have been doggedly pursuing for the better part of two decades. Clyde Hutchison, an investigator at JCVI and lead author of the new study, explained the motivation: “We want to understand at a mechanistic level how a living cell grows and divides,” he told The Scientist, and yet, “there is no cell that exists where the function of every gene is known.” Possession of such fundamental knowledge, he added, would also put researchers “in a better position to engineer cells to make specific products,” like pharmaceuticals, Hutchinson said. The team’s starting point was the bacterium Mycoplasma genitalium, which has the smallest known genome of any living cell with just 525 genes. However, it also has a very slow growth rate, making it difficult to work with. To practice synthesizing genomes and building new organisms, the team therefore turned to M. genitalium’s cousins, M. mycoides and M. capricolum, which have bigger genomes and faster growth rates. In 2010, Venter’s team successfully synthesized a version of the M. mycoides genome (JCVI-syn1.0) and placed it into the cell of a M. capricolum that had had its own genome removed. This was the first cell to contain a fully synthetic genome capable of supporting replicative life. Using JCVI-syn1.0 as their starting material, the researchers initially designed a minimal genome based on information from the literature and from mutagenesis studies that suggested which genes were likely essential. They divided this genome into eight overlapping segments and tested each one in combination with the complementary seven-eighths of the standard JCVI-syn1.0 genome. All but one of the designed segments failed to sustain viable cells. Equipped with this knowledge, the team redesigned, synthesized, and tested new genome segments retaining the quasiessential genes. Three iterative cycles of testing later, the team had a genome that successfully supported life. “This is a really pioneering next step in the use of synthetic biology,” said Leroy Hood, president of the Institute for Systems Biology in Seattle who also did not participate in the research. C.A. Hutchison III et al., “Design and synthesis of a minimal bacterial genome,” Science, 351: 1414, 2016. A goal in biology is to understand the molecular and biological function of every gene in a cell. One way to approach this is to build a minimal genome that includes only the genes essential for life. In 2010, a 1079-kb genome based on the genome of Mycoplasma mycoides (JCV-syn1.0) was chemically synthesized and supported cell growth when transplanted into cytoplasm. Hutchison IIIet al. used a design, build, and test cycle to reduce this genome to 531 kb (473 genes). The resulting JCV-syn3.0 retains genes involved in key processes such as transcription and translation, but also contains 149 genes of unknown function. INTRODUCTION In 1984, the simplest cells capable of autonomous growth, the mycoplasmas, were proposed as models for understanding the basic principles of life. In 1995, we reported the first complete cellular genome sequences (Haemophilus influenza, 1815 genes, and Mycoplasma genitalium, 525 genes). Comparison of these sequences revealed a conserved core of about 250 essential genes, much smaller than either genome. In 1999, we introduced the method of global transposon mutagenesis and experimentally demonstrated that M. genitalium contains many genes that are nonessential for growth in the laboratory, even though it has the smallest genome known for an autonomously replicating cell found in nature. This implied that it should be possible to produce a minimal cell that is simpler than any natural one. Whole genomes can now be built from chemically synthesized oligonucleotides and brought to life by installation into a receptive cellular environment. We have applied whole-genome design and synthesis to the problem of minimizing a cellular genome. RATIONALE Since the first genome sequences, there has been much work in many bacterial models to identify nonessential genes and define core sets of conserved genetic functions, using the methods of comparative genomics. Often, more than one gene product can perform a particular essential function. In such cases, neither gene will be essential, and neither will necessarily be conserved. Consequently, these approaches cannot, by themselves, identify a set of genes that is sufficient to constitute a viable genome. We set out to define a minimal cellular genome experimentally by designing and building one, then testing it for viability. Our goal is a cell so simple that we can determine the molecular and biological function of every gene. RESULTS Whole-genome design and synthesis were used to minimize the 1079–kilobase pair (kbp) synthetic genome of M. mycoides JCVI-syn1.0. An initial design, based on collective knowledge of molecular biology in combination with limited transposon mutagenesis data, failed to produce a viable cell. Improved transposon mutagenesis methods revealed a class of quasi-essential genes that are needed for robust growth, explaining the failure of our initial design. Three more cycles of design, synthesis, and testing, with retention of quasi-essential genes, produced JCVI-syn3.0 (531 kbp, 473 genes). Its genome is smaller than that of any autonomously replicating cell found in nature. JCVI-syn3.0 has a doubling time of ~180 min, produces colonies that are morphologically similar to those of JCVI-syn1.0, and appears to be polymorphic when examined microscopically. CONCLUSION The minimal cell concept appears simple at first glance but becomes more complex upon close inspection. In addition to essential and nonessential genes, there are many quasi-essential genes, which are not absolutely critical for viability but are nevertheless required for robust growth. Consequently, during the process of genome minimization, there is a trade-off between genome size and growth rate. JCVI-syn3.0 is a working approximation of a minimal cellular genome, a compromise between small genome size and a workable growth rate for an experimental organism. It retains almost all the genes that are involved in the synthesis and processing of macromolecules. Unexpectedly, it also contains 149 genes with unknown biological functions, suggesting the presence of undiscovered functions that are essential for life. JCVI-syn3.0 is a versatile platform for investigating the core functions of life and for exploring whole-genome design. Researchers have developed two methods to avoid the unchecked spread of engineered genes through wild populations. “Gene drive” is a phenomenon that causes a gene to be inherited at a rate faster than Mendelian principles would dictate. It relies on genes that can copy themselves onto a corresponding location in a paired chromosome, thereby overriding typical allele inheritance patterns. In conjunction with CRISPR/Cas9, gene drives can be created with almost any DNA sequence, raising questions about the risk of engineered genes spreading quickly through a population. But a team of researchers from Harvard University published a study this week (November 16) in Nature Biology that offers some safety constraints on the system. description of the first CRISPR/Cas9 gene drive system was published in March by a team at the University of California, San Diego, and showed rapid spreading of a normally recessive phenotype inDrosophila. Other labs are researching the system’s potential to wipe out insect-borne diseases such as malaria by spreading mutated genes throughout a mosquito population. But the strategy carries the risk of accidental contamination of wild populations. Esvelt’s team developed safety protocols—ways to prevent or reverse a released gene drive—using the yeast Saccharomyces cerevisia. One technique genetically separates the components necessary to create a gene drive, putting one half directly in the yeast genome and the other half on an external strand of DNA. The researchers also developed a method that uses one gene drive to overwrite the effects of another. RNA-guided gene drives capable of spreading genomic alterations made in laboratory organisms through wild populations could be used to address environmental and public health problems. However, the possibility of unintended genome editing occurring through the escape of strains from laboratories, coupled with the prospect of unanticipated ecological change, demands caution. We report the efficacy of CRISPR-Cas9 gene drive systems in wild and laboratory strains of the yeastSaccharomyces cerevisiae. Furthermore, we address concerns surrounding accidental genome editing by developing and validating methods of molecular confinement that minimize the risk of unwanted genome editing. We also present a drive system capable of overwriting the changes introduced by an earlier gene drive. These molecular safeguards should enable the development of safe CRISPR gene drives for diverse organisms. A powerful new CRISPR/Cas9 tool can be used to produce homozygous mutations within a generation, but scientists call for caution. A new genetic-editing technique based on integratingCRISPR/Cas9 technology into a Drosophila melanogaster genome can make homozygous mutants in half the time it would take using traditional crosses, according to a paper published today (March 19) in Science. A rare mosaic female fly, with a lighter left half mutated by MCR and a wild-type darker right half. 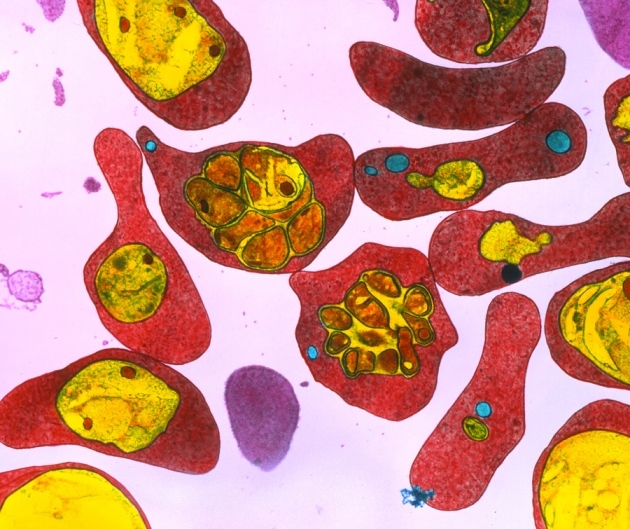 A method that can spread genetic changes rapidly through populations could aid the fight against the malaria parasite, shown here infecting red blood cells. A genome-editing method that could allow researchers to rapidly engineer entire populations has had an important upgrade. A US team has added safeguards to reduce the chances that such ‘gene drives’ will escape the laboratory, and found a way to erase the genetic mutations after they have spread. Gene drives hold the potential to wipe out insect-borne diseases and can speed up some genetic studies in the laboratory. But if released into the wild — whether intentionally or not — gene drives could irrevocably scar entire ecosystems. The safeguards, published today in Nature Biotechnology1, may calm some fears about the technology. One of the techniques provides a way of genetically separating the components that fuel a gene drive, so that the engineered mutation will not spread as rapidly through a population. Another is a molecular ‘undo’ button: sending a second gene drive out to undo the effects of the first. The concept of a gene drive is an old one that was given new life by the advent of a genome-editing technique called CRISPR–Cas9. It allows researchers to make targeted changes to a genome with unprecedented ease and versatility. Esvelt and others quickly realized that this technique could be used to engineer a gene drive by incorporating the genes encoding the Cas9 enzyme, which cuts DNA, and the guide RNAs, which direct Cas9 to a specific site, into the genome. Once present on one chromosome, the system can copy itself and the desired genome modification to the other chromosome, thus racing more rapidly through a population than a mutation would normally spread. The first demonstration of this was published in March2 by developmental biologists Valentino Gantz and Ethan Bier at the University of California, San Diego. The team used gene drives to speed up genetic studies in certain species of fruit flies. But the publication kicked off concerns that the gene drive might escape from the lab into the wild, and the US National Academies of Sciences, Engineering and Medicine tasked a committee with evaluating the benefits and risks of the technology. Even so, some researchers have embraced the approach, particularly as a means to prevent the transmission of insect-borne diseases such as malaria, says Esvelt. George Church, a bioengineer also at the Wyss Institute and a co-author on the latest report, predicts that gene drives to wipe out malaria and the tick-borne Lyme disease will be developed within the next two years. Esvelt is also collaborating with tropical-disease specialist Paul Brindley of George Washington University in Washington DC to study the application of gene drive to wiping out schistosomiasis, a disease caused by parasitic trematode worms. So he and his colleagues decided to develop safety measures using the yeast Saccharomyces cerevisiae. The organism is easy to work with in the laboratory and unlikely to spread a gene drive into wild populations because of its infrequent sexual reproduction. Site-specific incorporation of nonstandard amino acids (NSAAs) into proteins enables the creation of biopolymers, proteins, and enzymes with new chemical properties, new structures, and new functions. To achieve this, amber (TAG codon) suppression has been widely applied. However, the suppression efficiency is limited due to the competition with translation termination by release factor 1 (RF1), which leads to truncated products. Recently, we constructed a genomically recoded Escherichia coli strain lacking RF1 where 13 occurrences of the amber stop codon have been reassigned to the synonymous TAA codon (rEc.E13.ΔprfA). Here, we assessed and characterized cell-free protein synthesis (CFPS) in crude S30 cell lysates derived from this strain. We observed the synthesis of 190 ± 20 μg/mL of modified soluble superfolder green fluorescent protein (sfGFP) containing a single p-propargyloxy-l-phenylalanine (pPaF) or p-acetyl-l-phenylalanine. As compared to the parentrEc.E13 strain with RF1, this results in a modified sfGFP synthesis improvement of more than 250%. Beyond introducing a single NSAA, we further demonstrated benefits of CFPS from the RF1-deficient strains for incorporating pPaF at two- and five-sites per sfGFP protein. Finally, we compared our crude S30 extract system to the PURE translation system lacking RF1. We observed that our S30 extract based approach is more cost-effective and high yielding than the PURE translation system lacking RF1, 1000 times on a milligram protein produced/$ basis. Looking forward, using RF1-deficient strains for extract-based CFPS will aid in the synthesis of proteins and biopolymers with site-specifically incorporated NSAAs. Pharmacogenomics needs new materials that are inert against the host and specifically active to modulate molecular metabolism towards wanted homeostasis of the physiological system. These can come from natural resources or men-made. That is why we must know the origin to improve. Recently, Synthetic Biology, even though it is a developing upcoming field, it is generating mile stones for applications in the clinic, the biotechnology industry and in basic molecular research. As a result, it created a multidisciplinary expertise from scientists to engineers. Among other things extending the search to first life on Earth is one of the many alternatives. Here I like to present how synthetic biology can be initiated onto Translational Medicine from adiscovery of molecules from the sea. Microorganisms played a role in evolution to start a life. 99 % of our genome is related to microbial organisms. initially there was a classical Microbiology, then evolved to Industrial Microbiology and Biotechnology then Microbial Genomics and now Microbiome and Health became the focus. Finally, the circle is getting tide into how microbiome involved with healthy and disease state of human? How they can be used that is what it really means to include microorganisms into human health for diagnostics and targeted therapies? Or should we start from scarcity? Microbiology is my first formal education and building block. Simple but help to understand system biology and the mechanism of life in a nut shell. The closest field is embryonic stem cell biology for building “synthesizing” a whole new organism. Then system biology and developmental biology also gain interest. The real remember the month of October in 2001 when DOE reported that they sequenced 23 organisms in Walnut Creek. Having seen presentation to identify microorganisms through complex crystal structure assays through chemical pathway at the Microbial Genomics Meeting organized by ASM in Monterey, CA in 2001. Discovery of microorganisms in marine life like in Mediterranean Sea, containing 38% salt,is very similar with finding circulating disease making cells. Yet, they are similar since both search for a specific needle in the pile. Furthermore, the unique behavior of enzymes from microbial organisms such as Taq polymerase or restriction enzymes made it possible for us to develop new technologies for copying and propagating significant sequences. When these early molecular biology methods are combined with the power of genomics and knowledge of unique structures in molecular physiology, it is possible to design better and sensitive sensors or build an organism to rptect or fix the need of the body. neither sensors nor synthesized organism model are complete since one is missing the basic element of life “transformation of information” the other is missing the integrity that once nature provided in a single simple cell. Having sensory smart chip/band/nanomolecule to redesign the cells may also possible if only we know the combination. Thus, we have options to deliver if we know what to be carried. As we come across, novel pathways or primary pathways of physiology gain significant interest to determine marine microbial compound for therapeutics since they are further away from the evolution three that gives an advantage for biomedical/translational scientist to avoid most part of th eimmune responses such as inflammation, toxicity. Yes, indeed these are not scientific tails but true since currently, 16 of 20 marine antitumor compounds under clinical trial are derived from microbial sources because marine microorganisms are a major source for MMNP discovery. However, isolation of these organisms. For example, pretreatment methods, enrichment, physical, and chemical techniques (e.g., dry heat, exposure to 1%–1.5% phenol, sucrose-gradient centrifugation, and filtration through cellulose membrane filters) can be applied to increase especially the less abundant specific groups of marine microorganisms, . A variety of pretreatment methods including recovery of these microorganisms. This reminds me ecosystem of the soil, since in soil the trouble is identifying the specific culture among millions of others. Regardless of the case, nutrients are the key for selecting and isolating any organisms but specifically, as a result any marine microbes have specific nutrient requirements for growth (e.g., sponge extract ) or chemical (e.g., siderophores, signal molecules, non-traditional electron donors, and electron acceptors. This also should remind us subject of Biology 101 Essential Vitamins and Minerals. What we eat who we are. For example, Bruns et al. employed technique where they employed different carbon substrates (agarose, starch, laminarin, xylan, chitin, and glucose) at low concentrations (200 μM each) so that they can improve the cultivation efficiency of bacteria from the Gotland Deep in the central Baltic Sea. As a result of this growth medium they were able to elevate yield, which is created higher cultivation efficiencies (up to 11% in fluid media) compared to other studies. Yet, another component must be addressed that is culture medium such as ionic strength for a microbila growth. For example, Tsueng et al. study on marine actinomycete genus Salinispora that can produce bioactive secondary metabolites such as desferrioxamine, saliniketals, arenamides, arenimycin and salinosporamide. However, they observed that three species of Salinispora, S. arenicola, S. tropica, and S. pacifica require a high ionic strength but S. arenicolahas a lower growth requirement for ionic strength than S. tropica and S. pacificaUsing after assaying them against sodium chloride-based and lithium chloride-based media. As aresult, there is a specificity for growth. In addition, energy must be supported imagine that in marine organisms the metabolism is very unique, may be slow and possibly. However, the main criteria is most of them grow under low oxygen conditions like tumors. Warburg effect posed a problem for human but helped microorganisms to survive and evolve. One’s weakness the other’s strength make a great teamwork for solving diseases of human kind es especially for cancer. This reminds us to utilize minerals, electrons specifically after all the simplest form of carbon metabolism based on biochemical pathways like Crebs cycle, one carbon metabolism and amino acid metabolism etc. Even though 90% of human body made up off microbial origin there are microorganisms that are not cultured yet. The irony is less than 1% of microorganisms can be cultured. Furthermore, they are not included for representing the total phylogenetic diversity. Therefore, majority of work concentrated on finding and cultivating the uncultured majority of the microbial world for MMNPs’. For example, an uncultivated bacterial symbiont of the marine sponge Theonella swinhoei producing many antitumor compounds such as pederin, mycalamide A, and onnamide A. In any conditions if any living needs to be recognized and remembered, their place would be either on top or the bottom of the stack. Microbiome searches for specificity among tone of other organisms to recognize the disease, changes in cell differentiation and pathways or marine microbiologist search for uncommon scarce organisms. Yet, both of them are beneficial with their unique way. Then what is the catch or fuss? The catch is screening to identify what makes this organism unique that can be use for human health. Translational medicine may start from the beginning of life from microorganisms created. This can be called with its newly coined named”synthetic biology” but if we go further than the conventional screening methods which include bioactivity-guided screening and gene-guided screening and increase the power with genomics we may call it “synthetic genomics”. As a result these signature sequences establishes the “unique” biomarkers or therpaeutics to be used for drug discovery, making vaccines, and remodulating the targeted cells. How? These microorganisms secrete these metabolites or proteins to their growth medium just like a soluble protein, if you will like a inflammation factor or any other secreted protein of our human body cells. Collecting substrate or extract the pellet could be the choice. 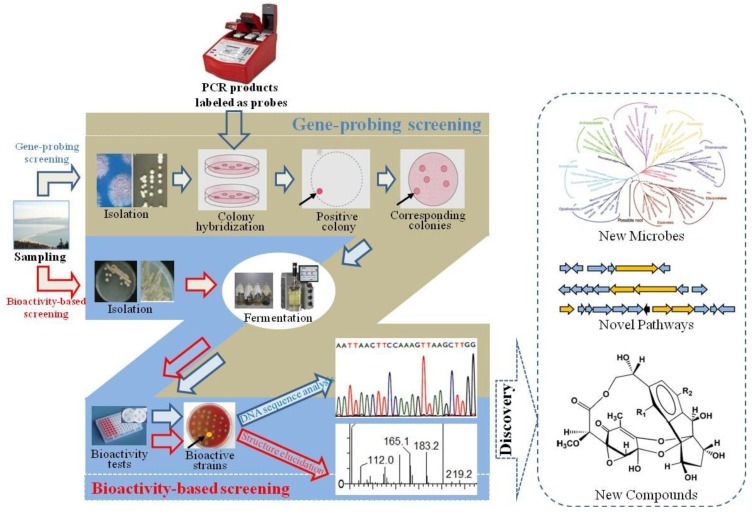 in a nut shell this require at least three steps: First, finding the bioactivity, apply bioactivity-guided screening for direct detection of the activity such as antimicrobial, antitumor, antiviral, and antiparasitic activities. Second, a bioinformatic assessment of the secondary metabolite biosynthetic potential in the absence of fully assembled pathways or genome sequences. Third, application on cell lines and possible onto model organisms can improve the process of MMNP discovery so that allow us to prioritize strains for fermentation studies and chemical analysis. This is a great method but there are two botle necks: 1. 99% of microbial organisms are not cultured in the labs. 2. Finding the optimum microbial growth and screening takes time. Thus, assesments can me done through metagenomics. However, metagenomics has its shortcomings since on face of living unless applications applied in vivo in vitro results may not be valid. The disadvantage of metagenomics can be listed as: 1. inability of efficient acquisition of intact gene fragment, 2. incompatibility of expression elements such as promoter in a heterologous host. On the pther hand, there can be possible resolution to avoid these factors so metagenomics-based MMNP discovery can be plausable such as development in synthetic biology by large DNA fragment assembly techniques for artificial genome synthesis and synthetic microbial chassis suitable for different classes of MMNP biosynthesis. However, many gene clusters have been identified by combined power of genomics and biioinformatics for MNP discovery. This is mainly necessary since secondary metabolites usually biosynthesized by large multifunctional synthases that acts in a sequential assembly lines like adding carboxylic acid and amino acid building blocks into their products. Synthetic biology triggers new era of antibiotics development. Review Ribosome engineering and secondary metabolite production. Adv Appl Microbiol. 2004; 56():155-84. High-throughput methods for culturing microorganisms in very-low-nutrient media yield diverse new marine isolates. Appl Environ Microbiol. 2002 Aug; 68(8):3878-85.
Review Cultivation of unculturable soil bacteria. Trends Biotechnol. 2012 Sep; 30(9):475-84. Characterization of growth-supporting factors produced by Geobacillus toebii for the commensal thermophile Symbiobacterium toebii. J Microbiol Biotechnol. 2008 Mar; 18(3):490-6.
Review Strategies for culture of ‘unculturable’ bacteria. FEMS Microbiol Lett. 2010 Aug 1; 309(1):1-7. Isolation of uncultivated anaerobic thermophiles from compost by supplementing cell extract of Geobacillus toebii in enrichment culture medium. Genome sequencing reveals complex secondary metabolome in the marine actinomycete Salinispora tropica. Proc Natl Acad Sci U S A. 2007 Jun 19; 104(25):10376-81. PCR screening reveals unexpected antibiotic biosynthetic potential in Amycolatopsis sp. strain UM16. J Appl Microbiol. 2007 Jan; 102(1):245-53. Biosynthetic origin of natural products isolated from marine microorganism-invertebrate assemblages. Proc Natl Acad Sci U S A. 2008 Mar 25; 105(12):4587-94. Cyclic AMP and acyl homoserine lactones increase the cultivation efficiency of heterotrophic bacteria from the central Baltic Sea. Appl Environ Microbiol. 2002 Aug; 68(8):3978-87. Marinomycins A-D, antitumor-antibiotics of a new structure class from a marine actinomycete of the recently discovered genus “marinispora”. A genomic screening approach to the structure-guided identification of drug candidates from natural sources. Chembiochem. 2007 May 7; 8(7):757-66. Engineered biosynthesis of antiprotealide and other unnatural salinosporamide proteasome inhibitors. J Am Chem Soc. 2008 Jun 25; 130(25):7822-3. A genomics-guided approach for discovering and expressing cryptic metabolic pathways. Nat Biotechnol. 2003 Feb; 21(2):187-90. Nat Biotechnol. 2003 May; 21(5):526-31.
Review The future of natural products as a source of new antibiotics. Curr Opin Investig Drugs. 2007 Aug; 8(8):608-13. Proc Natl Acad Sci U S A. 2001 Oct 9; 98(21):12215-20.